URAYASU, CHIBA— Oriental Land Co., Ltd. announced today that a new, family-friendly, affordable Disney hotel will be developed within the Tokyo Disney Resort® area. 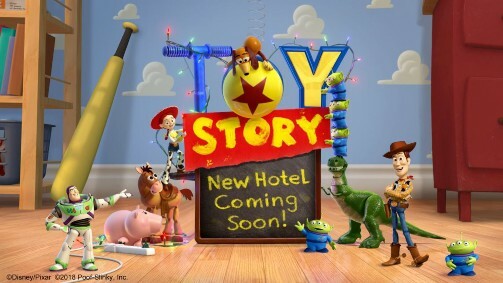 Based on the Toy Story films, the approximately 600-room hotel is projected to open in fiscal year 2021*. From the hotel exterior to the spacious gardens, Guests will enjoy a world where everything looks like it is made of toys. The guest rooms are inspired by Andy’s bedroom, where Woody, Buzz Lightyear and all the other toys live, designed with colorful furniture and other immersive features inspired by the world of Toy Story. The hotel guest rooms will be the standard type and amenities will include a restaurant allowing Guests to enjoy a casual resort stay at a reasonable price. Oriental Land is planning to open new areas at Tokyo Disneyland® and Tokyo DisneySea® Parks in 2020 and 2022 respectively. And with this new hotel, Tokyo Disney Resort will be able to meet the needs of even more Guests and continue to offer a rich experience in a world of Disney dreams that never end. Background Story: Andy, the little boy who loves his toys – Woody, Buzz Lightyear and the rest – has embarked on the ultimate backyard project: a building to house all his toys. When Andy is called away by his mom, his toys and their helpers take over the “toy” tower and open it as a hotel for all the “honorary” toys of the world. Management Form: Owner — Oriental Land Co., Ltd.
Facilities: Restaurant, Disney shop, parking, etc. *The fiscal year is April 1, 2021 to March 31, 2022.